While looking for camera and navigation apps for your Smartphone, you may have often come across the term Augmented Reality. This rather newly implemented technology makes it possible to interact with real world objects through your devices’ display (remember Pranav Mistry’s SixthSense?). In this article, we’ll explore different augmented reality apps that help us to see objects in different ways. Got an iOS, Android or Windows Phone device? Dive in to the world of augmented reality with these apps. Augmented Reality is a technology that tries to “enhance” our real world experience by making inanimate objects more interactive. The technology basically uses digital illusions, either visual or any other form, that relate to the real world scenario. Augmented Reality apps are usually implemented to provide more information about our immediate surroundings. The simplest example of such an app would be one that that identifies a shop, building or a place of interest in front of you. The implementation of AR lies in the fact that this information is usually superimposed on the display when you hold up the device’s camera against an object (Sure, your daily use QR Code Readers also fall in this category, but we are not going to discuss them here). For augmented reality apps to work correctly, you have to ensure that the following hardware is available on your device. GPS: Apps that support Augmented Reality generally display results based on location based searches. Without accurate location tracking tools, such as GPS, your augmented reality experience would be quite rough. Most AR apps don’t function without turning on location services. Magnetic Sensor (Compass): AR apps rely a lot on accurate direction based data. Without a Compass, an Augmented Reality app cannot display information accurately, as it won’t know which direction you are pointing to. This may hamper your AR experience. Most AR apps usually don’t work at all if the compass is missing on your device. Orientation Sensor (Gyroscope, Accelerometer): Again, for better results, these apps need data to determine how you are holding the device. This data helps AR apps to change the position of on-screen information according to device’s orientation. We have compiled quite a few Augmented Reality apps that are both useful and interesting. Sure, there are plenty of AR apps that can help you locate places of interest, be it hotels, restaurants, coffee shops etc. Here are few apps you can use. Wikitude World Browser uses your camera to label important landmarks, restaurants, ATMs and more in your surroundings. Just hold up your camera and you’ll see all important buildings around you. Wikitude can label different types of places and objects according to the category you select. Featured lookups include Events, Accommodation, Restaurants, Travel, etc. It also has an Explore Around You mode to display places of interest. Wikitude retrieves local information from multiple sources like Yelp, Trip Advisor, Google Maps, etc. Layar gives you multiple layers of information about buildings, events and places of interest. Just launch Layar and point your phone towards something that interests you, and see the screen fill up with information. Looking for a place to eat? Hold up your smartphone and Layar will point you to all restaurants and cafés in close vicinity. You can even turn real life objects into interactive elements with Layar. Look at a magazine or news article through your phone and get related stories, news links and videos on your screen. Here City Lens offers similar services to Layar and Wikitude on Windows Phone devices. Just hold your phone up and reveal the best shops, hotels, and other interesting places around you. You can also get directions to a selected point, or peer reviews from different services. Additional features include tagging and sharing places among friends. Wonder what’s up in the sky and beyond? Then these apps are for you. 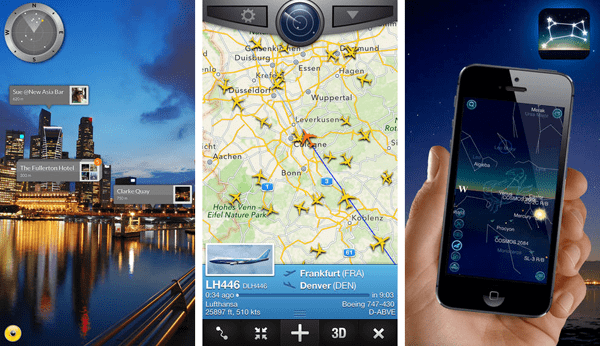 FlightRadar24 gives you live flight traffic updates on map as well as in Augmented Reality. You can hold up your phone towards the sky and get live detailed information about flights moving over you. Are you a star-gazer? Put Google Sky Map on your phone and watch stars anytime you want. Google Sky Map gives you a live labelled map of known stars, planets and other heavenly bodies overhead (works even during day time). If you miss Google Sky Map on your iOS device, a very good alternative would be Night Sky. Launch Night Sky and watch the stars in space right from inside your living room. It includes some incredible background music to engage you in a mesmerizing journey into space. The full version extends the functionality of the app to include additional features like satellite tracking, night mode, custom location based star gazing, community connections and more. Get Night Sky2 to get a complete stargazing experience. These apps will help you keep track of academic and career building activities around you. Looking for jobs? Get this AR app on your Lumia phone and get going. Just point your phone towards buildings around you to look for job openings in your vicinity. The app is developed by Nokia Corporation and meant for the Lumia line of smartphones only. This is a similar app from Nokia for college goers and students who are looking for internships nearby, capable of converting into a full time position in the biggest names in the industry. Use the app to see different internships available in your surroundings, in augmented reality. Internships Lens fetches information from multiple sources including Internships.com, Salary.com, LinkedIn, Facebook, Twitter, and many more. This section is for game addicts and take their gaming experience into the real world. Here are some AR apps that might keep you entertained for some time. Feel like a Ghostbuster? Go outside with your smartphone and see through the screen to reveal ghosts and apparitions roaming around the real world. Catch ghosts to unlock new titles and bonuses and advance through the ghostly world of augmented reality. Want to get lost in the limbo? Inception the app will give you a first hand experience of how living in your dream world can feel like. Put on your headphones, activate the Inception app, and get lost in your dreams. This is a fast paced, alien shooter, augmented reality game that turns everything around you into a battlefield. Shoot down incoming alien ships and save your planet from invasion. AR Invaders also support multiplayer gaming, so you and your friends can join together to form an army and defeat the alien race. Augmented Reality apps make real world objects digitally interactive and give us live information about what we are seeing. Try these apps and let us know if you liked using them. Also, if we have missed any good ones in this article, you can write down in the comments below.